80 Grange Road. 10 units of upscale condominiums. Completed: Around May 1999. One unit/floor. Type of tenant: Suits senior expats who just want privacy and less chances of encountering noisy kids and be near downtown. Unlikely to need tennis court or big pool as the American Club is just down the road (around a 3-min drive). Interior: Living/dining - white with greyish streaks marble tiles from ground to 5th floor and maroon coloured marble tiles from 5th - 10th floor. Bedrooms - light yellow birch timber strip flooring. Built-in wardrobes and doors of light yellow birch timber making interior look spacious and bright, especially for Caucasian prospective tenants. Kitchen cabinet: Yes. Black granite tiled flooring & breakfast table for two. A small window brings in sunlight and some views. A very small serving hatch opens from the kitchen to living area. Air conditioning system all rooms and kitchen with sensor controls attached onto ceilings, not seen in other condos. 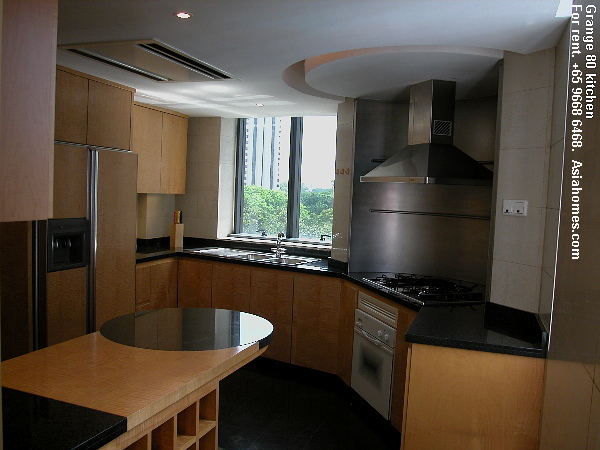 Appliances: Elba cooker hob and hood, oven, Amana ice-making refrigerator, washing machine & dryer. Bathrooms: Light brown marble tiles. Hair dryer & shaving points in bathroom 1 and 2. Jacuzzi bath in the master bedroom is unique in that it can accommodate the tallest American or Dutchman. Shower cubicle available too. Granite vanity top & water heater in all bathrooms except W.C (maid's bathroom). Built-in wooden cabinet between living & dining room. Electronic safe in master bedroom. Covered basement car park, small pool with jacuzzi jets in the middle of the pool, wading pool, small gym, sauna, steam room. Private lift lobby with magnetic access card system to individual apartment. Security guard, audio-visual intercom system. Fort Canning Hill Club membership at S$150/month. Legend Golf Club in Johor, Malaysia - pay green fees only. Part-time maid services at 3x/wk. Great location, being a 7-minute walk to the Orchard subway and malls. Low density of 10 units (Grange 80) and therefore no crowds and not so many boisterous expat children (high energy and noise are stereotypical of expat Caucasian children). Appeals to senior managers whose children have had grown up and who really don't want the screams of kids. Bedrooms sited away from the living/dining area, ensuring greater privacy. Private lift servicing one unit/floor. 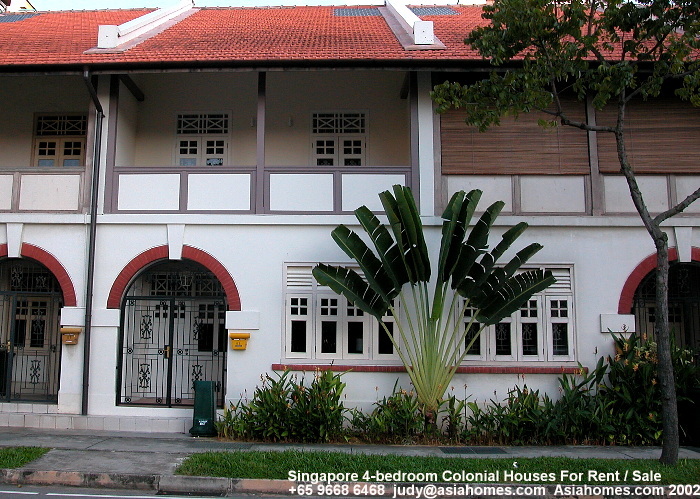 7-minute walk to Orchard Road. Expat wives who don't work usually meet friends at Orchard Road cafes, a focal point of action and shopping. Expats who don't have cars appreciate being close to the subway and Orchard Road. Large capacity jacuzzi bath for the tallest Dutchman or American. This is a rare feature in most new condos in Singapore and many tall Caucasian husbands are resigned to bathing in the shower since most bath tubs are too small. Irregular-shaped living and dining area may not be able to fit the large dining table with 8-10 chairs and big living sets. The other upscale condo for rent is: Grange 70. Great location within walking distance to the Orchard subway. 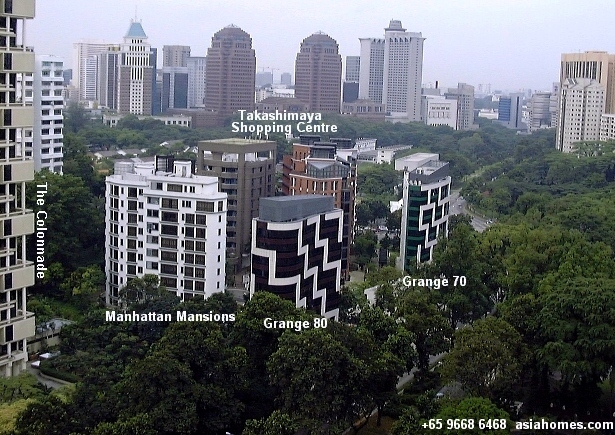 Grange 80, #01-01, Type A1, 1,335sf is S$2.67million. #10-01, Type A, 2,282sf is $5.1 million. or tel: (65) 9668 6468, 254 2728, 254 3326, fax: (65) 256 0501, 4545 843. 10 units. Grange 70 layout plans. An unusual management of an expatriate housing policy. "Get another agent since this Asia USA Realtor can't find a condo for the employee, " commanded the CEO of a well known American multi-national company. The new arrival liked the brand new Aspen Heights Condo, was given a $3,500 budget for a 2-year lease. 1. Diplomatic clause. 8+2. That is, 8 months' occupancy plus 2 months' notice or rent in lieu of notice when the Company wants to terminate the lease. The common practice is 12+2. Since the employee only wanted Aspen Heights Condo, no self-respecting Landlord will accede to this demand as demand is greater than supply as regards this condo. 2. No good faith deposit to be given to the Landlord even though the Letter of Intent is subject to contract. Apparently, the company had some irrecoverable debts of $60,000 from previous tenancy matters and will not part with any good faith. For popular condos like the Aspen Heights Condo, a delay of one or two days is sufficient to lose the unit since almost 100% of the 2-bedrooms have had been let and few units were available as at September 1, 1999. 3. Must use the Company's tenancy agreement. Will not entertain tenancy agreement from the Landlord. This is quite a common policy amongst the big companies. 4. If the outside tenancy agreement is to be used, the Company would need at least 14 days to read the contract. Units were taken up by then. 5. Asia USA Realty found another brand new condo. The Landlord's tenancy agreement was scrutinized and required various amendments. For example, the penalty interest in the event of delay in payment of rent was asked by the Landlord at 1.5%. The Company wanted 1.0%. 6. How about the employee signing a personal lease? No housing allowance would be given to the employee to sign the lease on a personal basis. 7. Pleas to the top management at the headquarters in the USA were ignored. There is something wrong with the management of expatriates in this multi-national company. The best revenge for an expatriate would be to find another employer later and let the Company pay for the remaining 8+2 months' diplomatic clause. After all, it is a corporate lease and he had been given hell. After 2 months, we were still sourcing the apartment for the distressed expatriate employee. All realtors would not want to waste time since it involved over 20 days of house-hunting only to be frustrated by the CEO! The Secretary now understood what was wrong since no other agent wanted to handle this case. And this is a multi-national company, not a mum-and-pop operation! Newcomer expats negotiating for housing allowance or rent need to be aware of the policies of the company. Many American multi-nationals do NOT have this inflexible and frustrating attitude and would like the newcomer to rent fast so as to save on the $400/day hotel charges or the higher cost of the serviced apartments! There are a few oil, airline and telecommunication companies which require the use of Company's tenancy agreement. There are also corporate landlords who reject such demands and want only their tenancy agreements or no business to be done. Each party is looking after its own interest and does not want to spend more on lawyers who will charge for advising on outsider's tenancy agreement.